only $12.99 and the cute little stand is just $9.99. Wouldn't these make great Christmas gifts? inventory. The kits include the background and all of the wool. You can get the frames here too! Wool kits are $33.99 and the frames are $29.99. In addition, a Christmas wool kit just arrived! Look at our new Row X Row license plate. Don't you just love it? There are some things in life that you just have to say, "Let It Go." 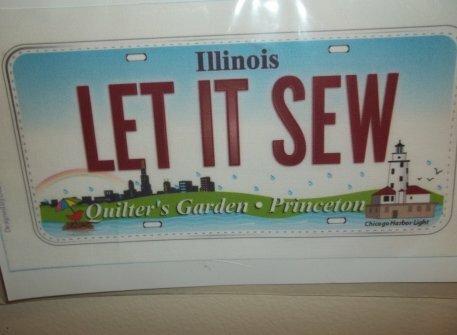 At Quilter's Garden we say, "Let It Sew!" New fabric is arriving daily. Our pre-cut section is growing with lots of new additions from Moda. Come in and check them out. They won't last long!